Losing weight is the top-most priority for many now-a-days. However, it is important to remember that you need not lose weight to gain acceptance from society, or to fit into the beauty standards that the media sets. The best way to find out whether you need to lose weight or not, is by getting your Body Mass Index checked. If your weight is more than what it should be as per your body’s configuration, only then must you try to embark on a weight loss journey. 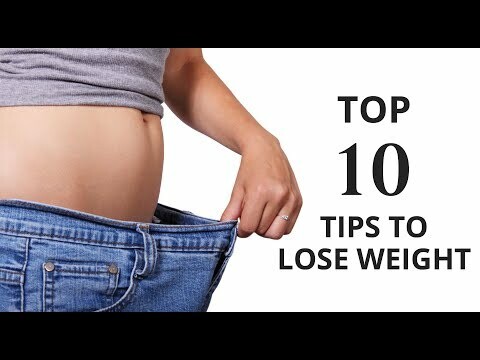 And we have put together a list of the Top 10 tips to lose weight that will guide you as to how exactly you should go about doing it. We hope that you benefit from them. While pursuing weight loss, we are often just in a hurry to get those extra kilos off. However, in the bargain, we forget that weight loss is a process and cannot happen with just one day of exercise. Setting goals without introspection will only lead to frustration when you don’t manage to achieve those unrealistic targets in real life. It is thus important to understand your body, identify the areas where you would like to lose weight, and set achievable goals to lose weight accordingly. That way, you won’t end up being too harsh on yourself, and can actually measure your progress and feel good about it. ‘Dieting” is one of the first ideas that will come to your mind when you think of losing weight. This would involve not eating some food items, or not eating some meals at all! Depriving your body of some types of food, or missing meals, will leave your body with no other option but to use your muscle mass to create energy. And after you get off your diet, your body will take on a defense mechanism that will store anything that you eat, as fat for later use. Eating everything in proper quantities, on the other hand, will ensure that your body gets all the nutrition it deserves while still preventing excess fat from accumulating in your body. One of the major causes of weight gain is over-eating. The best way to avoid conscious or subconscious over-eating, is to be aware of whether you are really hungry or not. When you use big plates, you tend to fill them up with more food than what you actually need. Using a smaller plate will make you feel like the food that you have served is a lot. Once you have served yourself, eat slowly, and be mindful of the taste and texture of each item you are consuming. That way, when your stomach has had its fill, you will not feel like eating any more. Further, you will not feel like snacking unnecessarily until the next meal time comes around. Metabolism is the process whereby the food you eat gets converted into energy. The body breaks down fats to generate this energy, and so, the better your metabolism is, the less fat gets stored in your body. Therefore, if you want to lose weight, you must try and consume foods that boost your metabolism. It is the most natural way to get rid of the fat in your body, and help you receive your correct nutrition at the same time. While you may have eaten mindfully, there are times when your body uses more energy, especially if you are working or doing some tedious task. At such times, it is natural for you to feel hungry even if it may not be meal time. However, if you need a snack, you shouldn’t just be popping in anything at all. Carry some healthy snacks like fruits or an energy bar that will give you actual nutrition rather than just temporarily satiate your hunger. Most of the times when we think we are hungry, it is actually thirst. So if you think that you need to eat something, first try drinking some water. You will be surprised that you may not really want to eat anything after that! Drinking a full glass of water 15 minutes before your meal will prevent over-eating, and cleanse your system to prepare it to absorb as much nutrition as possible from the food that will be consumed. Sugar is well known to be an enemy of anyone trying to lose weight. The body breaks down sugar into glycogen that is stored for later energy production. However, this storage capacity is quite limited. After the limit is reached, any further sugar is then stored as fat. Therefore, consuming too much of sugar will lead to fat gain, that will hamper your weight loss journey. It takes a lot of energy to keep your body in an erect position. This energy is created by burning fat. Deep breathing involves a greater oxygen intake that will help burn fat at a quicker rate. So, by just sitting erect and breathing deeply instead of slouching and breathing to barely half of your lungs’ capacity, you can burn a lot of fat and lose weight. When you decide that you want to lose weight, you must be clear from day 1, that it will not be an easy process. Just sitting around does not require any energy, and so, it causes all the food that you eat to be stored as fat. When you exercise the demand for and increased energy supply, is met by burning this fat. And so, if you want to lose weight, then exercising is a must, and cannot be avoided at any cost. When you sleep, your body is not only resting, but is also healing and rebuilding itself. During your weight loss journey, your body is working extra hard at burning fat, creating energy, and balancing your need for nutrition. Therefore, it is more than necessary to give it its due time of rest, so that it can be rejuvenated enough to keep up with your changing diet and levels of activity involved in the process. If you don’t rest enough, your body cannot adapt to the changes, and you will either see no progress, or fall ill instead of losing weight. If you follow these tips, you will definitely have a fruitful and successful weight-loss journey. Remember, you may have to work a little harder to get fit now, but it will keep you healthy for longer in the years to come. So put in that extra effort, and it will be worth it, for sure! WeBeingFit gives you top 10 tips for weight loss which doesn’t require exercise or diet. We will guide you that just by making few simple changes in your daily routine you can lose weight and can be fit not only physically but mentally too.